July 12, 1955 – The architect of the city’s Bureau of Engineering, M. J. Glicken, says that a sculpture of “a woman with other ornamentation” [Chicago Daily Tribune, July 13, 1955] is being readied for placement on a city parking garage at Wacker Drive and State Street. The bronze sculpture, which is 12 feet high and 14 feet wide and weighs three tons, is the work of sculptor Milton Horn, whom Mayor Richard J. Daley personally asked to create the monumental work that would show Chicago’s important place in the country and the world. Controversial from the beginning, the sculpture was taken to the city’s bridge repair shops at Thirty-First Street and Sacramento Avenue when the garage was torn down in 1983. Ignored for nearly 15 years it was restored for ten times the amount that the original commission brought Horn. Today the sculpture hangs from the northwest portal of the Columbus Drive Bridge. More about the sculpture and its creator can be found in Connecting the Windy City here. 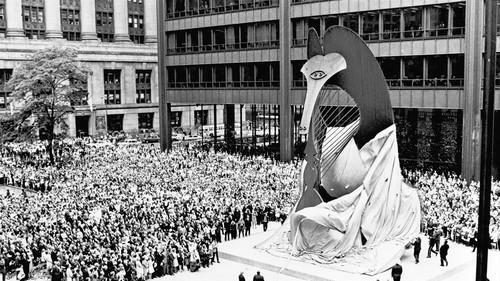 July 12, 1970 – The Chicago Tribune reports on a challenge against the Public Building Commission of the city, involving the right to reproduce the image of the Picasso sculpture. In its suit, filed before Federal Judge Alexander J. Napoli, The Letter Edged in Black Press, maintains that Pablo Picasso gave the work of art to the people of Chicago, not to the building commission. The suit uses statements of Mayor Richard J. Daley and architect William H. Hartmann at the dedication ceremonies for the sculpture in 1967, in which both men talked of the artist’s gift “to the people of Chicago,” to support its assertion. The building commission responds that much was done to secure the rights for reproduction, including “securing from Chicago a written deed of gift which gave them the right to secure a copyright, affixing the copyright notice to the rear of the sculpture’s metal base, registering and securing a copyright claim, and notifying the public of its licensing policies.” [Chicago Tribune, July 12, 1970] The commission further maintains that the deed of gift which Picasso signed, giving the commission the right to reproduce the sculpture is the same as a copyright. Incidentally, the official website of the CIty of Chicago proclaims to this day that "Picasso gave the sculpture as a gift to the people of Chicago." The photo above was taken when the sculpture was dedicated on August 15, 1967.